On a chilly night at the Hollywood Palladium, hundreds of people stood waiting for P!nk to take the stage, proving that the artist still has plenty of draw after two decades of performing. P!nk began her set with the incredibly appropriate “Get the Party Started,” to which the crowd enthusiastically danced and sang along to. This was followed by another song off of her 2001 album, M!ssundaztood, and the crowd reacted just as excitedly to “Just Like a Pill.” These tracks set the tone for the rest of the show, which consisted of several of her older hit songs. She continued on to play songs from her albums Try This and I’m Not Dead, beginning with “Trouble” and before moving on to “Who Knew,” she commented about not having done a show where she wasn’t hanging upside down in while. Before moving on to her hit single from her album Funhouse, she spoke to the audience about having recently lost someone and shared kind words about hanging in there. The mood was lightened when she forgot the lyrics but charmingly recovered and transitioned into a cover of Gwen Stefani’s “Just a Girl,” followed by introductions and solos for each band member. The visuals on the massive screen behind them were impressive and accurately matched each song. A huge contrast in visuals came with her next song, “Try,” from her album The Truth About Love, and they went away completely and left a single spotlight on P!nk as she sang “For Now” from her latest album. She was much more active, joining in with her backup dancers in perfect sync as she sang “What About Us,” another hit from Beautiful Trauma. “Barbies” and “I Am Here” followed, and despite a few incidents of inebriated audience members spontaneously leaving the crowd, P!nk successfully held the attention with her impressive vocals. 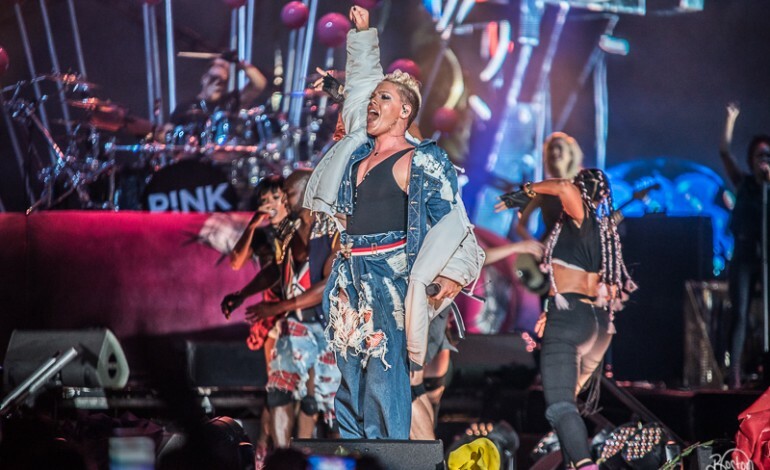 After making sure that an audience member who had a few too many was taken care of, P!nk sang “F**kin’ Perfect” and a cover of Bishop Briggs’ “River” after a quick change into a plaid shirt. Her supposed last two songs were “Blow Me (One Last Kiss)” and “Raise Your Glass,” but the crowd was not fooled and everyone stayed in place waiting for the inevitable encore. The older, and likely nostalgic, crowd was pleasantly surprised when she covered “What’s Up?” by 4 Non Blondes. Her final song was “So What,” a very energetic end to the set that the band impressively extended out as the crowds poured out of the venue.